Mister Rogers arrives with a towel which he uses to play peek-a-boo before a quick game of hide-and-seek with viewers. 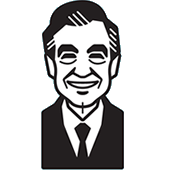 After talking about a time when he was young and playing hide-and-seek, Mister Rogers sings Please Don't Think It's Funny. Returning to the towel he brought with him, Mister Rogers shows a film about how people make towels. In the Neighborhood of Make-Believe, Lady Aberlin and Prince Tuesday are drying off after a swim as King Friday is visited by a representative of the Strothers Racing Towel Company. Mr. Strothers demonstrates his racing towels and informs the King that the Neighborhood of Make-Believe has been chosen as the site for the Make-Believe Olympic Games. Lady Aberlin escorts Mr. Strothers around the Neighborhood as he asks for everyone's permission to host the games. Everyone quickly gives their permission except Lady Elaine Fairchilde who will only give her permission if she is guaranteed to win the games. Back at the house, Mister Rogers pretends that his towels are racing towels before he talks about being a graceful loser: "Being the best loser takes talent just as being the best winner does." Mister Rogers concludes for the day by singing It's You I Like. If you'd like to check for racing towels in your own home, according to the procedures followed by Mr. Strothers, simply lay the towel in front of you and say, "Overcome the gravitational pull and move forward." Racing towels will speed off. Fred Strother is credited in this episode as "Fred Strothers" and the others on the show clearly refer to him as "Mr. Strothers." Prince Tuesday refers to Cornflake S. Pecially as "Uncle Corney." With no direct relation between the two, this is likely intended to be a simple term of affection used by the young prince. Special Thanks to: Fieldcrest Towel Mills Inc.